Sky Pilot Mountain is the highest of a tightly knit group of jagged peaks located southeast of Squamish behind the Stawamus Chief. 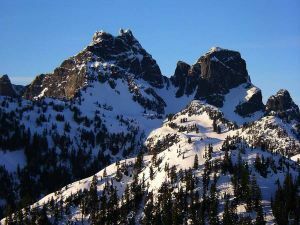 The easiest approach is via Shannon Creek and the easiest summit route the south ridge (Class 2-3). Here is a list of some named but somewhat obscure subpeaks, rock towers, etc: (They are documented here, rather than as separate "peaks" in order to avoid crowding the maps. Name Notes: The term "Sky Pilot" is a term in widespread use since at least 1911, whne it was a silent film directed by King Vidor, set in California, and referring to a preacher who comes to clean up a small town. Later in 1968, there was a well known song by Eric Burdon and the Animals titled "Sky Pilot", which itself explains the meaning of "Sky Pilot". "Makes them feel happy he's a good holy man". When Named: According to research by Glenn Woodsworth, the first ascent party in 1910 did not name the peak. At that time it was known as "The Sisters". Glenn says he's pretty sure that although the first ascent was in 1910, the name "Sky Pilot" was only applied by topographic surveyors S.C. McLean and K.G. Chipman, who climbed the peak in 1919, nine years later.